Objects are evocative; they hold stories. The writing challenge this week is to begin with an object. It stood, alone, in the middle of the circle of stones, at first in darkness. As Siris got closer he thought he saw a faint glow. Was this a trap? He was very close now, another step or two and he could touch the weapon. Clouds masked the moon, suddenly the world was very still. “In silence”, had said Isa, “remember me, be aware, be ready to fight.” He was, all his senses on alert. He was able to lift his gloved hand, but stopped. He could hear the low humming, and knew at once it came from the stone that held the weapon. In slow motion he surveyed the scene: he was alone, with IT. He took off his glove and seized the handle: at first the metal – if it was metal – felt cold, and heavy. Slowly, oh so slowly, he lifted the Blade. It was heavy, and he felt a slight vibration along his arm, in his hand. The Blade was getting warmer and lighter. He felt its warmth now in his fingers, stiff with frost. He held the Blade high, weighing it, slashed the air around him with it: he could hear the impact against the cold molecules, as if a fine silk had been split with a razor. Siris paused, looking at the Blade he held in front of him, now shining in the obscurity that wrapped everything. How terribly beautiful was the Blade! The fog was rising. And he heard them: the Titans were coming. 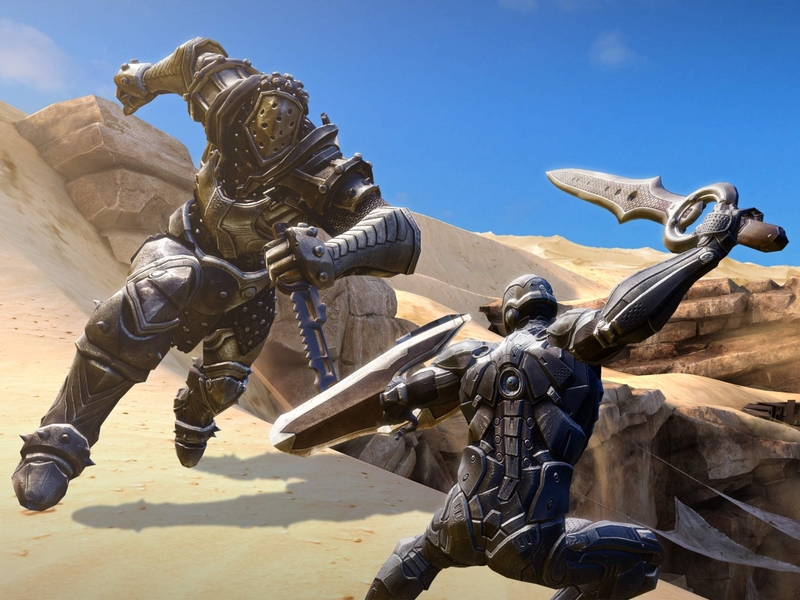 But he, Siris, was now holding the Infinity Blade. Suddenly the Blade was lighter, its handle fitting tight in his hand. As he slained the first Titan, with one blow, in a shower of dark light, his thoughts were to the Worker of Secrets, who had, eons ago, forged the Blade. Enjoyed reading this and getting lost in a whole different world!